Unfinished Project: wide open spaces. So you know how I'm always talking about how my biggest challenge in life is defining what it is that I want to do and how the only thing that I do know that I want- to write a book - just feels impossible sometimes and I have too much self-doubt and not enough motivation and all I need is someone or something to help me finish what I started? 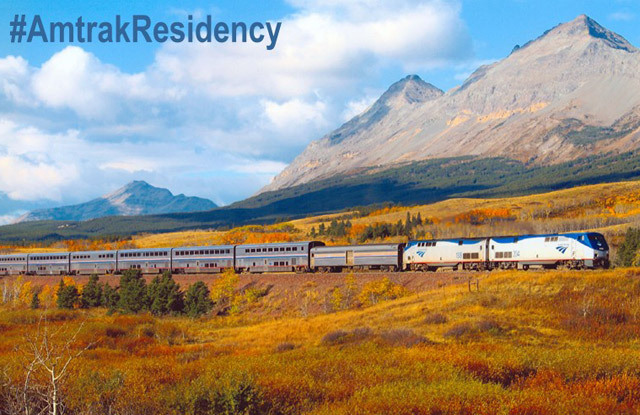 The program started as an innocent suggestion of writer Alexander Chee, who admitted in an interview that he loved writing aboard a train and that Amtrak should offer a residency program. From there, a Twitter firestorm of writers who agreed with Chen - so much traffic, in fact, that Amtrak created a program that will choose 24 aspiring writers to take long-distance trains to work on their projects. I can't think of an opportunity more well suited for me. Honestly, I thought about not telling anyone about this amazing program, for fear you'd all run immediately to their site and apply, therefore instantly diminishing my own chances. But I also need some accountability here - so if I tell you I'm applying, I'll actually have to actually apply. So far my personal experiences with train rides include a summer jaunt around Europe with a bunch of girlfriends and then falling hard for a Mountain Man on our romantic trip from Yosemite to San Francisco. It's only fitting that the next installment in my crazy life should involve finishing my book aboard a train, am I right? I probably won't have to tell you what I'm doing this weekend -thinking of clever ways to get noticed by Amtrak. Steph, i always enjoy your blog - so i really can't wait for your book! i am a HUGE fan of Amtrak - it's such a comfortable way to travel (and work). it's anti-plane travel. keep writing, adn i'd love to see your application. from one relationship to another.